Like the holiday residence in Breukeleveen from 1941 this house for a surgeon and his family, too, stands where land meets water. But this is 20 years later and Rietveld now presents a radically different concept: a composition of rectangular volumes varying in both height and colour. Its 3.8 metre tall living space looks out through a full-width window wall across the meadows. A sliding partition connects the elongated living room with the master bedroom. The other rooms are assembled in less-tall volumes. 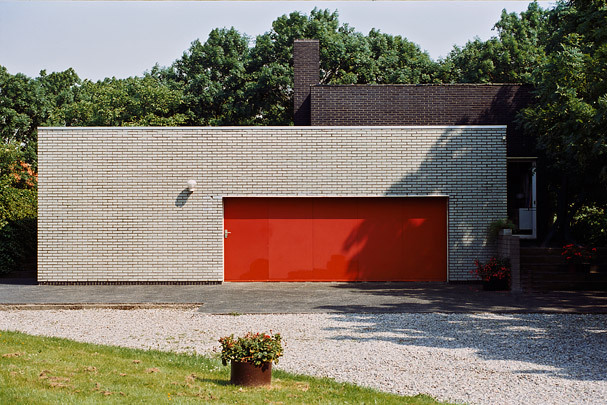 The frontage has a black, white, grey and blue glazed brick cladding with a deep red for the garage door. An absence of visible roof overhangs and the set-back window frames serve to strengthen the free-standing aspect of the bricks walls.